Are you ready to expand your fall repertoire with more plant-based protein choices? Here is a NEW fall class, a cookbook suggestion and several other health tips. Read to the end for a tasty recipe. 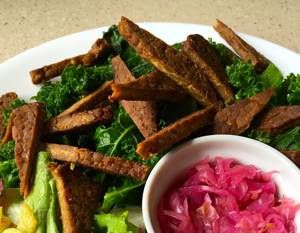 Tempeh Jerky, Soup Medley of Heirloom Beans, Boiled Greens, Steamed Greens with Umeboshi Vinegar and a Pumpkin Pudding, served with Naturally Fermented Sauerkraut A scrumptious, organic lunch is included. You will learn which nutritious add-ins take your home-crafted soups to the next level and what ideal tools to use. Come learn how to make delicious and satisfying bean dishes and special techniques for pressure-cooking, steaming, boiling and baking. Lenore will also discuss how to adapt your cooking for cooler weather. You will learn the traditional cabbage-based sauerkraut recipe and get directly involved in the process. Lenore will also be covering the tremendous health benefits when you add fermented foods to your diet. She will have some suggestions for variations and tastings of other fermented recipes. Lastly, salad's nutrition improves greatly by using healthy dressings. 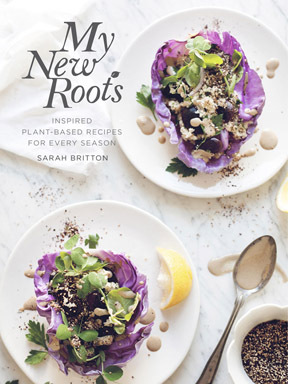 “My New Roots: Inspired Plant-Based Recipes for Every Season” is a mostly vegan cookbook. Wonderfully described recipes, copious techniques and expansive recipe collection. I have just started cooking dishes from it and am very impressed. Because sea vegetables contain so many trace minerals, they can taste bitter. Here is a recipe with sweet, salty, bitter, pungent and umami tastes which balance the flavors and actually transform a highly nutritious, yet strong-tasting food into a delicious dish! sprinkle of toasted sesame oil, optional, but delicious! 1. In a large bowl, cover arame with water. Wash and drain 3 times, removing bits of sea shells, etc. 2. Heat oil in a non-stick skillet. Add the onion and pinch of salt; sauté until translucent, about 5 minutes. 3. Place arame on top of the onion. Add ½ inch of water. Bring to a boil. 5. Add soy sauce and toasted sesame oil to taste. Stir to mix onion with the arame. 6. Place corn kernels on top of the mixture. Cook covered for 3 minutes. 7. Cook uncovered a few additional minutes until almost all of the liquid has cooked off. Stir. 8. Serve garnished with scallion, optional. 9. Keeps refrigerated for about 5 days. Substitute carrot matchsticks for corn. Please feel free to forward our newsletter to interested family and friends.